Blog » WIN a family ticket to see Snow White and the Seven Dwarfs at Romiley Forum! 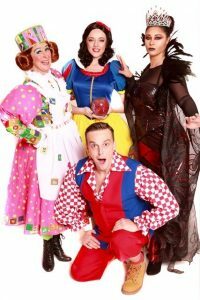 WIN a family ticket to see Snow White and the Seven Dwarfs at Romiley Forum! Thanks to our lovely friends at JB Productions, we have a ticket for a family of 4, to give away! The prize is for the 4:30pm showing on Sunday 17th December. 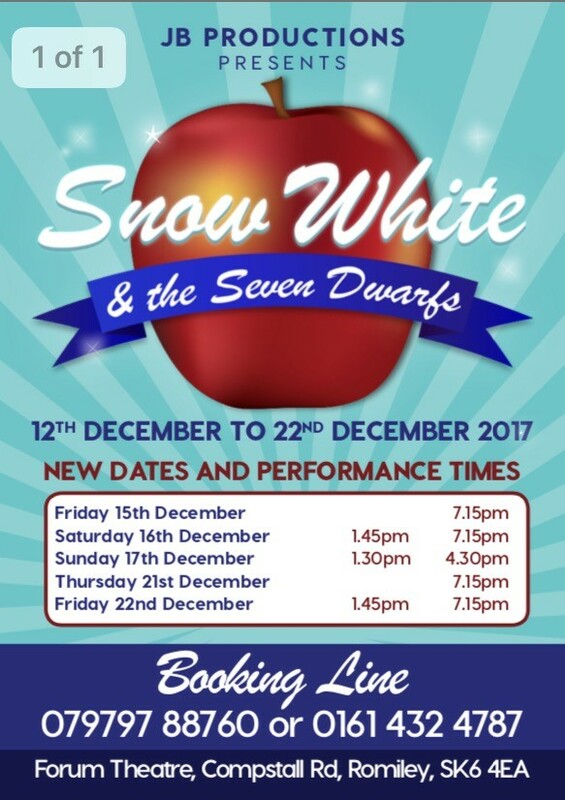 All you have to do is send the name of just ONE of the seven dwarfs, using the contact form HERE by 7 pm on Saturday 11th November. If you are not lucky enough to win this time, you can still book tickets via the booking line: 07979788760 or 0161 432 4787. The show will be running from 12th December to 22nd December 2017. Tickets are priced at £10.95 for adults and £5.95 for children. JB Productions have been at the theatre for the past 15 years. Many of their patrons return year on year to share in the delight of a wonderful family show with their children and grandchildren. This years production of Snow White promises to be one not to miss. To keep up to date with what else is happening in Stockport and locally in the run up to Christmas, make sure you keep an eye on the website. We will be listing lots of festive fun activities, pantos and places to see Santa in the coming weeks. This competition is open to any person resident in the UK who is over 18 years old. Employees of the Forum Theatre Romiley, its affiliates, subsidiaries, advertising or promotion agencies are not eligible. Employees of Stockport Mumbler are not eligible. By entering, the participant agrees to be bound by these terms and conditions. The Ticket is a family ticket for 4. 2 Adults and 2 children. The winners must be available on Sunday 17th December at 4:30pm. The closing date is 7 pm on Saturday 11th November. The winner will be notified by telephone or e-mail by 7pm on Sunday 12th November. The promoter reserves the right to withdraw this offer or amend these Terms and Conditions at any time and without notice. 9. In the event of any dispute regarding the Terms and Conditions, the conduct, results and any other matter relating to this prize draw, the decision of the promoter shall be final and no correspondence or discussion shall be entered into.